Like the human body, concrete must be warmed or covered in the winter. Both fresh and newly-hardened concrete lose moisture and heat rapidly in cold-weather conditions. You must protect cold weather concrete against early freezing to assure adequate strength development. 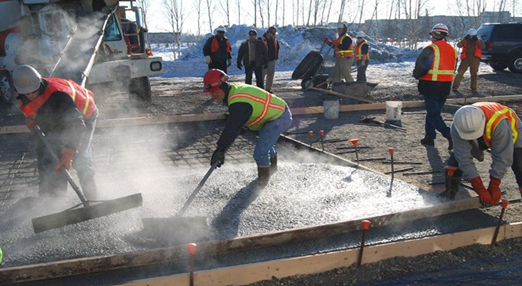 Consider using low-slump concrete for flatwork in cold weather to cut setting time and reduce bleed water. Cold air retards the evaporation rate and setting time of concrete. Use concrete mixes containing accelerating admixtures or Type III Hi-Early Cement that require shorter protection time from freezing. Recognize that concrete mixes containing fly ash require longer protection time from freezing. Snow and ice must be removed from all concrete forms and the subbase before pouring concrete. Make sure that the temperature of the subbase and any other surfaces that come into contact with the concrete are not below freezing. Never begin final finishing operations while bleed water is present. Avoid overworking cooled slabs that exhibit delayed setting characteristics. All concrete must be cured—cold weather included. Do not allow hardened concrete to dry out. Use insulation blankets or heated enclosures to maintain concrete temperatures above 50 degrees Fahrenheit for three to seven days. Then maintain the concrete temperature above 40 degrees Fahrenheit for at least four more days. Curing and temperature protection from start to finish should be continuous and uninterrupted until the concrete develops its desired strength. After curing and attainment of strength, remove the protection in such a manner that the temperature of the concrete will not drop faster than more than 40 degrees Fahrenheit in 24 hours. Critical area like edges and corners require extra protection in cold weather because they are exposed to heat loss in two or more directions. When using artificial heat, make sure all exhaust gases are vented to the outside. All concrete exposed to freeze/thaw cycles and deicing chemicals must be protected with a high-quality concrete sealer. Call your knowledgeable Kuhlman representative for help with cold-weather project planning, ready-mixed concrete designed for cold weather, and required curing, sealing and insulating materials.